VeniceConnected.com, in addition to offering signficant advance purchase discounts, just got a little more convenient according to yesterday’s press release. In addition to the PNR (reservation code) issued uponn purchase that’s good for issue of transit passes and public bathroom access, you now have the possibility of printing your own museum pass. This would enable you to head directly to the ticket taker, without having to stop at any Venice Connected point or have a separate ticket issued at the museum…bypassing lines entirely. It doesn’t look like the instructions have been updated yet to reflect this new functionality, but perhaps they’ll come with the information received from your purchase. This entry was posted in Venice Connected, Venice Instructions, Worth Noting and tagged advance booking, booking, museums, tickets, venice on May 19, 2009 by Living Venice. Venice is now Connected, ur-rah! If this works, it could be a very good thing. Active as of today, VeniceConnected.com guarantees you lower prices for a variety of venues and services (along with avoiding having to stand in line to buy them) if you book through their site. You must make your purchase at least 15 days in advance, but low, medium, and high visitation periods are colorfully indicated on the calendar you’ll use in the booking process, so you can determine when your savings will be greatest. At the moment, you can reserve parking, purchase public transport passes (from 12 hours to 7 days, good for ACTV vaporetto & land buses), Alilaguna airport transfers, museum passes, paid toilet services by the day or the week. Wi-fi access (city-wide availability due mid-year!) and Casinò entrance are included with any other purchases. I’ve created a VeniceConnected article with more info, usage instructions, and some screen shots. If you use the site, do come back and post your experience with it. This entry was posted in Venice Connected, Venice Instructions, Worth Noting on February 1, 2009 by Living Venice. Beginning February 1, the multi-lingual avatar Giulia will be at VeniceConnected.com to help you reserve selected services in advance of arriving in Venice…and letting you know when they’re discounted the most (that is, when the city is less crowded). If this works, everyone will benefit: Venice, travelers, vendors…maybe even locals. With Giulia’s assistance, VeniceConnected.com will allow the traveler to review a variety of services, reserving and paying in advance for those they need. 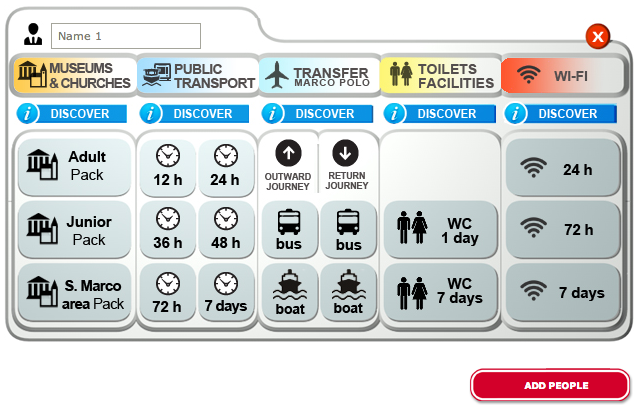 At the moment these are limited to vaporetto passes, museum tickets and passes, parking (don’t park, drop the rental), and so on, but more will be added as time goes on, including city wi-fi access when it arrives later this year (woot!). According to the press release, the site will function as a one-stop-shop, where instead of going to individual sites to purchase various services, you can not only accomplish it in one operation, but score a discount in the bargain. Once you select your service and make your payment, you’ll be assigned a voucher number, that will give you direct access to the prepaid services, and a bar-code that will allow you to check the status of the services you’ve purchased. If you’re plannng a trip yourself, you’ll have to give it a try and get back with your results. This entry was posted in Venice Connected, Venice Instructions, Worth Noting on January 22, 2009 by Living Venice.